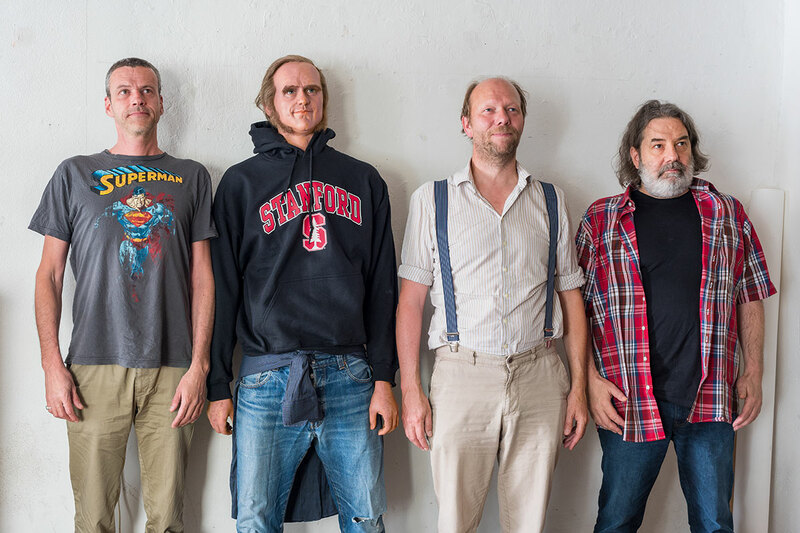 Steinbrener/Dempf & Huber is an Austrian artist group consisting of the sculptor Christoph Steinbrener, the photographer and graphic designer Rainer Dempf, and the architect Martin Huber. In 2005, “The Delete!” project in Vienna’s Neubaugasse involved covering all commercial signs such as business signs or advertising posters with yellow paper. The following project series Copy/Paste, took the opposite approach: advertising, corporate logos, and PR posters were made clearly visible, albeit with a shift of context and deliberately misplaced, for example in 2007 with a feigned conversion of the Church of St Ursula in Linz into a Starbucks store (Pass the Buck). In 2008, Jesuitenkosmos concealed Andrea Pozzo’s ceiling painting in Vienna’s Jesuit Church beneath a modern secular heavenly structure. The method of displacement led to the 2009 exhibition Trouble in Paradise at Vienna’s Schönbrunn zoo, in which Steinbrener/Dempf & Huber installed foreign objects (cars, toxic waste barrels, railway tracks) in the animals’ enclosures, highlighting the confrontation of nature and civilization. The Freeze! exhibition that opened at the Vienna Museum of Natural History in June 2012 was an attempt to replace the romanticizing view of animal depictions with a realistic view of the modern conditions of growing civilization. For the show, Steinbrener/Dempf revived an old display used in natural science, the diorama. In collaboration with the museum’s taxidermists, they presented snapshots of wild animals in urban settings that are usually only familiar from Internet videos or exotic travel documentaries. In 2015, they mounted an ibex on the head of the forty-three meters tall Bismarck monument in Hamburg, drawing attention to resurgent German nationalism – the title of the piece: Capricorn Two. In 2016, almost at the same time, the Viennese artist collective opened the two highly conspicuous “comments” on the architecture of their city, the sculptures Sign of the Times (on the façade of the Hotel InterContinental) and Lunch Atop (on the roof of a Viennese high-rise). Steinbrener/Dempf & Huber have created series of large-format photographs in recent years. In one series, images of dioramas made in collaboration with the taxidermists of the Natural History Museum in Steinbrener/Dempf & Huber’s studio. In another they developed “miniature dioramas”, that also serve as three-dimensional sketches. The carefully arranged Tierstücke (animal pieces) in the classical 17th-century Flemish style focused exclusively on the figured representation of mounted animals, using staged gestures and postures to unite elements that are zoologically incongruous.